The Universe, all its matter and energy have been formed in a process called Big Bang, about 13,3 billion years ago. In this same process also the time started, and the natural forces, i.e. the gravity, the strong and weak force, and the electromagnetic force were formed. Even that the very cause of the origin of the Universe is not known, the first moments of its development are now understood on basis of the cosmological studies and quantum physics, and have been experimentally studied and verified by the very large particle collider physics, which allow the forming of new elementary particles via collisions in very high speeds and energies. 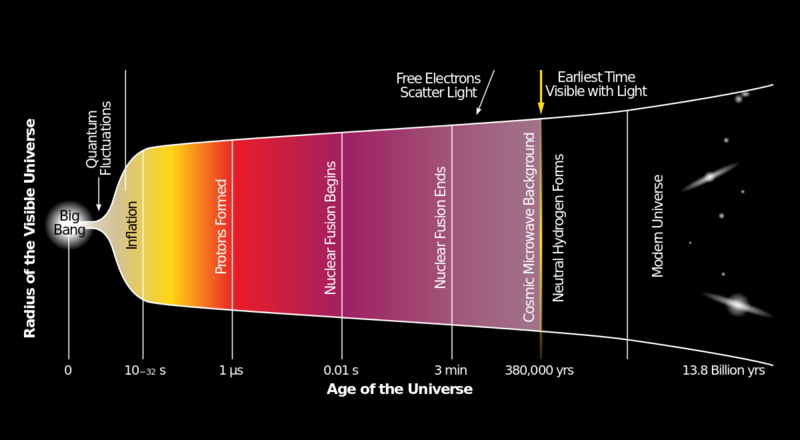 After the shortest measurable time, or the Planck’s time (10-43 s), the processes advanced very very fast. The young Universe expanded at a speed much faster than the speed of light, and this process was therefore quit and silent. This ultimately fast first expansion of the Universe is called Inflation. This huge expansion caused an ultimately large release of energy, which was partly converted to various elementary particles and their antiparticles. These, via mutual collisions again annihilated to photons and other particles. All particles were forming and annihilating at the same rate; they remained in thermal balance. After the first moments, at 10-36s after the beginning, the inflation state relaxed and turned into so called Hot Big Bang, or an ultimately hot, and exposingly fast expanding Young Universe. After about a trillionth of a second (10 -12) had passed, the first particles, or Higg’s bosons started to fall out of thermal balance, meaning that they were not formed any longer by particle collisions, but these particles still annihilated by their collisions with their antiparticles. These bosons provided the mass-properties to all of the other particles, except for photons, which remained mass-less. Other particles followed in turn fall out of thermal balance. Within one millionth part of a second, at the temperature of 1012K, the expanding universe contained only quarks (the particles of baryonic, or visible matter), leptons and photons (e.g. electrons). At 10-5 s the quarks combined with one another and formed hadrons, i.e. protons, neutrons and mesons. Most of these still disappeared, but those protons and neutrons that remained do now form the nuclei of all elements in the universe.